Computer problems? Computer Service Professionals can help. You can depend on us. Whether you only use your computer for Email and web searching, or you're a large company with an enterprise network, we have the expertise and experience to solve all of your computer problems. Need answers? No one person has all the answers! However, we belong to a large network of highly experienced service experts and we can get the answer to any computer problem almost instantly. A system problem can be caused by many different hardware (or software) failures. We use a complete set of diagnostic tools to rapidly pinpoint the exact cause of a system failure. We can then give you an accurate repair cost making the repair/replace decision much easier. It is a fact that more computers stop working because of software problems than hardware failures. An operating system error can prevent a computer from starting up and a bad driver can stop peripherals from working, and these are only a few of the many software problems that can plague a computer user. 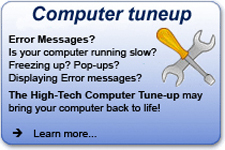 We can repair any type of software failure. Setting up a new computer system correctly is more than just plug in and go. Un-needed bloatware has to be removed, security parameters set for maximum safety, all updates installed, performance optimization implemented and peripherals installed. In addition, if you have more than one computer, you will need network and possibly wireless access setup and secured. Let our experts take the worry out of a new installation. There are now more homes with multiple computers than with only one. Home networks allow you to share the Internet and data and a wireless network permits you to move your laptop anywhere in your house without running wires. We can service any sized network from a simple residential setup to a large company enterprise system. If there is anything that all computer users have in common, it is that they all surf the Internet and use Email. We can help you setup, maintain and service your Internet and Email. We can help you choose the best Internet provider and make sure that it operates at the fastest possible speed. In the past few years the threats from malicious software have increased exponentially. More ominously, today it is not only your computer and files under attack, but your very identity. Let us perform a comprehensive security check and insure that you are as fully protected as possible. 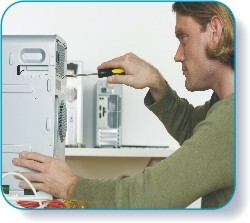 If you have been attacked, our state of the art removal tools can completely clean your system. Cables strung across the floor are not only unsightly, but can pose a safety danger. Our professional cable installation experts can feed the cables through walls and ceilings to outlets next to your equipment. Dust can be a deadly enemy of computers. It can clog up internal fans causing the computer to overheat with the possibility of damaging major components. Our regular maintenance procedures not only clean your computer physically, but makes sure that all appropriate updates have been performed, optimizes your system for faster performance and removes un-needed files clogging your hard drive space. © Copyright 2011 Computer Service Professionals. All Rights Reserved.